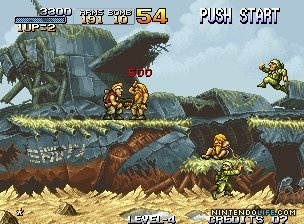 i finally broke out of my up-to-now handheld-only gaming year by continuing my exploration of run ‘n gun games outside of the contra series with the first game in the metal slug series, via metal slug anthology on wii. the game was enjoyable (and it was nice not to have to worry about running out of quarters/continues), and doesn’t take itself too seriously (the POWs you rescue hide the bonuses they reward you with behind a pair of striped boxers before revealing them with a flourish). the game places more of an emphasis on bombs and vehicles (not to mention violence) than other games in the genre that i’ve played, which helps give it a different feel, but otherwise there wasn’t a lot that felt unique, especially compared to the most recent game in the genre i’ve finished, gunstar heroes. the weapons feel pretty standard, as do the locales and boss fights. i went ahead and played a bit of the sequel and already it looks like it’ll be more unique, but for now i’m going to set the disc aside.